Is compliance with international labour standards good for economic development, or does non-compliance give countries a competitive advantage? Are we faced with a ‘race to the bottom’ with respect to labour standards? And how might the answers depend on a country’s level of development as well as on the particular industries and labour standards in question? In the absence of clear-cut answers, debates about the impact of labour standards on economic development have only intensified with the rapid expansion of preferential trade agreements including labour provisions as well as debates over such contested mega-regional trade agreements as the now defunct Trans-Pacific Partnership (TPP) and the Transatlantic Trade and Investment Partnership (TTIP), which have generated heated discussions in a number of high-level policy forums. As old as these questions are, we still lack anything like definitive answers to them. Knowing the answers should not call into question the objective of improving compliance with international labour standards, but rather inform the strategy by which this is pursued. 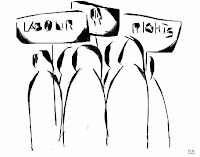 In spite of there being a fair amount of research, a key bottleneck in moving forward is adequate measures for many international labour standards, particularly for freedom of association and collective bargaining (FACB) rights which are intrinsically difficult to measure. To address this gap, new labour rights indicators and an accompanying dataset, both focusing on FACB rights, have been launched by the Center for Global Workers’ Rights at Penn State University together with the Global Labour University. The importance and role of FACB rights has long been contentious in spite of their being one of the International Labour Organization’s (ILO) four fundamental rights at work, as well as a human right enshrined in the United Nations’ Universal Declaration of Human Rights and other international and regional human rights instruments. 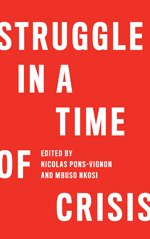 These rights are particularly salient not only because of their direct impact on labour and economic outcomes, but because they are indispensable pillars of democracy as well as the processes of democratization and the long quest for social justice. The Nobel Peace Prize of 2015 acknowledged this, as it was awarded to the Tunisian National Dialogue Quartet – including both workers’ and employers’ organizations – for its contribution to building a pluralistic democracy. The importance of deepening our understanding of the developmental effects of compliance with international labour standards is all the more pressing in light of the UN’s recently adopted Sustainable Development Goals (SDGs), which contain targets referring to the need to protect labour rights (SDG 8, target 8) and protect fundamental freedoms (SDG 16, target 10). Concerns over these rights as well as their deterioration was also expressed in a 2016 report to the UN General Assembly by the Special Rapporteur on the rights to freedom of peaceful assembly and of association in the workplace (Kiai, 2016). The new labour rights indicators and dataset aim to provide comprehensive quantitative and qualitative information on the status of FACB rights in the world. 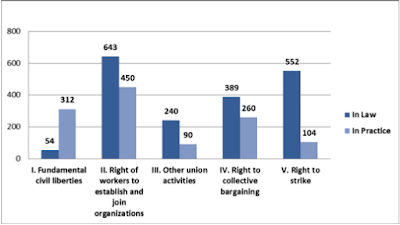 The indicators are directly based on the definitions embodied in ILO Conventions 87 (Freedom of Association and Protection of the Right to Organise) and 98 (Right to Organise and Collective Bargaining Convention) as well as related ILO jurisprudence. The labour rights indicators address FACB rights in both law and practice. They are constructed for nearly all ILO member states by coding the findings of nine textual sources, including primarily reports produced by the ILO supervisory bodies but also the International Trade Union Federation’s flagship survey on violations of trade union rights, the US State Department’s human rights reports, and national legislation. Information from these sources is coded according to 108 evaluation criteria representing different types of FACB rights violations, such as violations of fundamental civil liberties, workers’ right to establish and join organizations, rights concerning the internal functioning of these organizations, rights to collective bargaining and the right to strike. The information is presented on the website in an accessible and transparent manner. Another novel aspect of the indicators is the application of the Delphi method to construct weights for the 108 evaluation criteria based on the opinions of internationally recognized experts in labour law with in-depth knowledge of the ILO’s supervisory system and FACB rights as defined by the ILO. The website facilitates analysis of FACB rights by enabling the user to navigate from different starting point, for example, through global maps, by countries or by types of violations. It provides an overall labour rights indicator as well as indicators in law and in practice. A key feature of the website is that it provides ready access not just to the coding of individual textual sources, but to the actual text from each of these sources, thus lending itself to legal as well as statistical analysis. Some of these textual sources may be regarded by some users as less credible than others. To accommodate such concerns, the website enables the indicators to be automatically re-calculated by deselecting any source or combination of sources. At present, the website provides indicators and data for the years 2012 and 2015, though it is planned that by the end of this year it will also include selected years back to 2000 and the data will be updated to 2016. Arrest and imprisonment of trade unionists in relation to their trade union activities (32%). As for labour rights indicators themselves, on a scale of zero to ten, with zero being the best and ten the worst possible score, the country group with the best average score is the Developed Economies & EU (1.5 for labour rights overall), while the group with the worst average score is the Middle East & North Africa (7.4 for labour rights overall), in which FACB rights are prohibited in nine out of the 18 countries. Among other developing groups, Latin America & Caribbean and Sub-Saharan Africa have the best average scores (3.5 and 3.7 for labour rights overall, respectively), with South Asia and East & South-East Asia & Pacific having middling average scores (5.3 and 4.5 for labour rights overall, respectively). 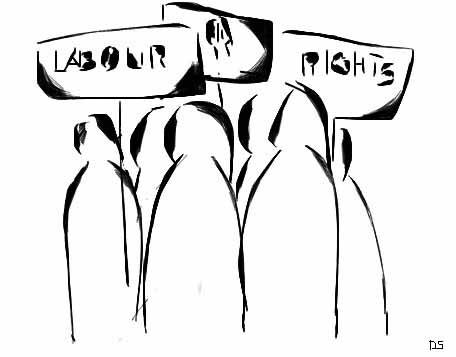 South Asia, East & South-East Asia & Pacific, Middle East & North Africa and Sub-Saharan Africa have substantially worse labour rights in law than labour rights in practice scores, suggesting that in these regions the primary violations are those in law which are further aggravated by violations in practice. The opposite is observed in the Central & South-East Europe (excluding EU member States) and Commonwealth of Independent States groups, suggesting that even where laws comply with FACB rights, they are violated in practice. All the information used in the construction of these indicators is already in the public domain, yet we believe there is considerable value making it more readily accessible and providing it with greater structure. This enables users to quickly see which FACB rights violations are more and less frequent, and how this differs among countries and regions and – as we update the indicators – over time. Improving FACB rights requires that violations of these rights are known, and known as widely as possible, and that their developmental impacts are better understood. It is hoped our project can make a useful contribution to these ends. Mark Anner is an associate professor of Labor and Employment Relations and the director of the Center for Global Workers’ Rights at the Pennsylvania State University. David Kucera is a senior economist with the International Labour Organization. Dora Sari is the senior advisor to the Labor Rights Indicators Project and a research fellow at the Harvard Labor and Worklife Program. Kiai, M. (2016) Report of the Special Rapporteur on the rights to freedom of peaceful assembly and of association, New York: United Nations.